Drop your two cents (or five) in the comment box below and let me know what inspires you to push to the proverbial finish line? 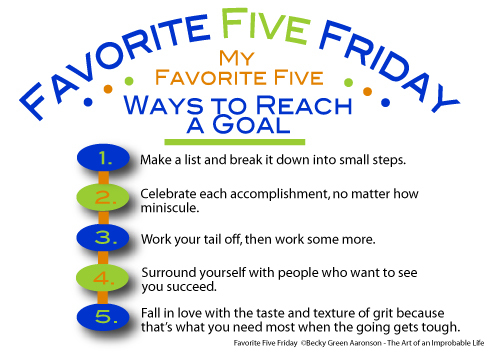 This entry was posted in Favorite Five Friday and tagged favorite five friday, goals, inspiration, New Year, reaching goals, success by Becky Green Aaronson. Bookmark the permalink. Oh yeah. #5. For sure. I like to get the small stuff out of the way first, too. And yes, giving yourself permission to take a break takes the pressure off (even if that pressure is purely self-imposed). Those breaks usually end up giving us new perspectives and new approaches to tackling what has stopped us in our tracks. Great list, Becky! I need it! Thanks, Cindy. Happy New Year to you! Go get em! Ask for support from loved ones. Sorry to say, I don’t always practice these, but I think they help when I do. Tina, I like this. I especially liked the vision board that you talked about on your blog yesterday. Great idea!